Hyderabad is India’s fourth most populous city. With work pressure mounting as surely as the summer heat, you are sure to need a short break once in a while. Going out and exploring nature around your city is a great way of getting rid of stress and calming your mind. The best places to go are obviously where there are waterfalls, as the soothing sound of water cascading down rocks and the surrounding hills and greenery give you a fresh lease of life. Here is a list of some great waterfalls around Hyderabad. The river Krishna flows through this area and falls down a small plateau creating the beautiful Mallela Theertham waterfalls. The special thing about this waterfall is that it is located on porous volcanic rock, so the rainwater does not collect during monsoons and just runs through the mountains into the Gundlakamma river. The waterfall is a sight to behold, majestic and powerful and is sure to fascinate you. The best time to visit is during the start of the winter season. Visiting the nearby temples and the dam should be on the top of your to-do list as well. This beautiful waterfall created by the Chandra Vanka river flowing through a few cascading rocks, is surely a beautiful sight. 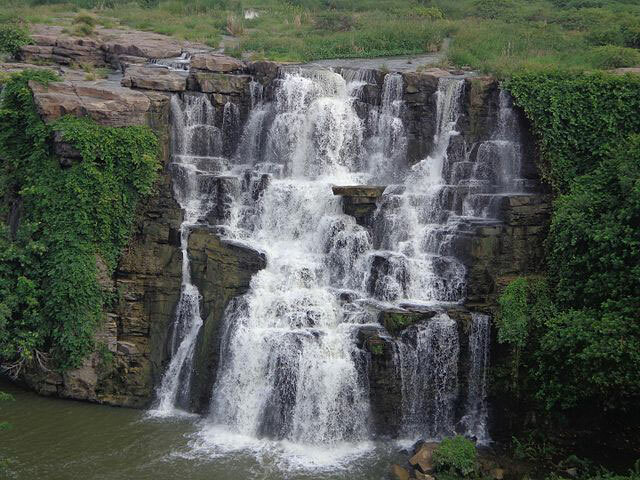 Just a two to three-hour drive from Hyderabad, Ethipothala waterfalls is a great place to go on short walks or treks. You can climb down to the falls for a closer look and feed the adrenaline junkie in you, even though it’s not an especially big or powerful waterfall. Lush greenery surrounds the falls from all sides, giving you a little slice of paradise here on Earth. The temples nearby are all beautiful and make sure you check out the Crocodile Breeding centre as well, to make some toothy reptile friends. A famous pilgrimage site, due to the ancient Shiv temple on its banks, this waterfall is beautiful and a great place to spend your weekend connecting with God. The best time to visit is between the months of November and February as this is when the flow of water is the most ideal to give you the full glory of the Kapila Theertham waterfall. Visiting all the nearby temples is an exhilarating experience and will give you a spiritual connection you might need after a hectic week in the urban jungle. 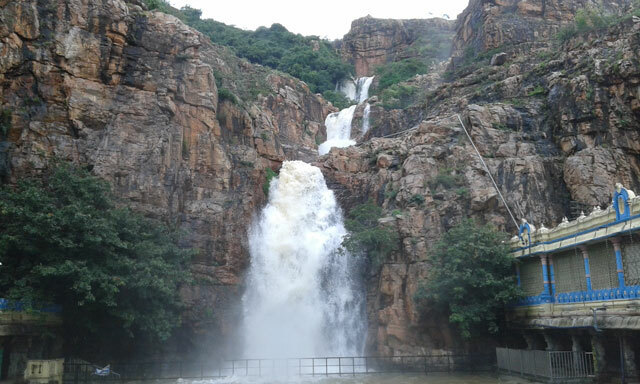 The name of two adjacent waterfalls, Kuntala falls is a famous spot for a weekend getaway for Hyderabad locals. With greenery on both banks and the beautiful stones the water cascades down from, you are sure to enjoy this sight. It is a three to four-hour drive from Hyderabad and the best time to visit is during the monsoons, as you will witness the falls in all their glory. Be sure to stay in zones near the banks as the slippery rocks and unseen pools may be dangerous even for the most experienced swimmers. 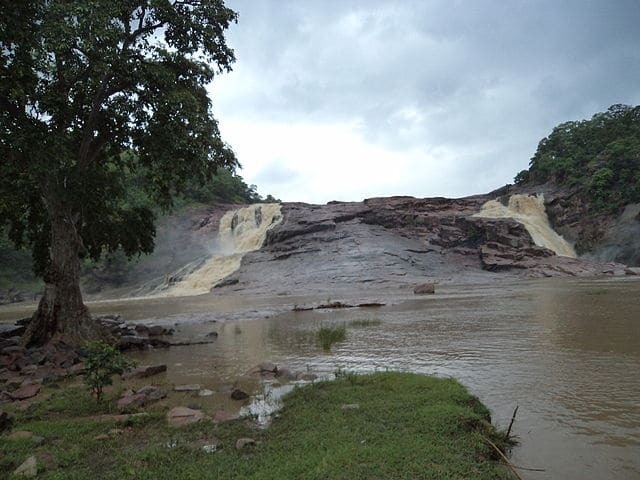 Located just around 20 kilometres from the Kuntala falls, Pochera falls is a beautiful and serene place you would want to walk around or even enjoy a picnic. The monsoons really bring out the full beauty of the falls and is usually the best time to visit. The nearby Kawal wildlife sanctuary should be one of your priorities to visit as you will get a full natural experience during your stay. Do make sure you visit the nearby temples such as Basar saraswaty temple. You are advised to keep a safe distance from the bottom of the waterfalls during the monsoons as the force of cascading water could be fatal. If you are in a mood for trekking or hiking, visiting the Tadimada waterfalls should be your number one priority. At half a day’s journey from Hyderabad, the Tadimada waterfalls are best seen during the monsoon months when the water flow is the heaviest. A tributary trickles down from a height of a hundred feet and you can also enjoy a swim at the pool created below the falls. Be sure to be careful as the water might be dirty and the wet rocks can lead to an unfortunate fall. Feel free to explore the nearby areas, all of which will offer great amounts of fun. Fed by the Gosthani river, Katiki waterfall is named after the village nearby. 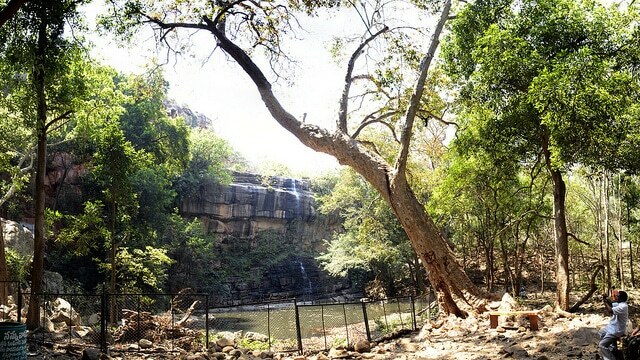 It is one of the cleanest waterfalls around Hyderabad. Just a short trek to the falls through lush greenery makes the journey and the destination worth it. The waterfall is located near the famous Borra caves, so you must make sure you visit both at the same time. Other attractions nearby are the Tribal museum and Tyda park. Be sure to visit during the rainy season as the increased water flow makes for a spectacular sight. Everyone needs to reconnect with nature after a long week of work and these waterfalls are sure to help. Perfect for people of all ages, spending time around nature with people sure makes for a beautiful and bonding experience.